Dreamtime is quiet hostel at night and not a party hostel. person must be over 18+ as we have a licence bar . This unique chilled out hostel is set among-st a tropical garden with an outdoor pool where guests can relax in hammocks and enjoy the chill-out atmosphere , clean and friendly with great personal staff makes Dreamtime one of a kind, not one of a chain. All rooms are fan cooled with free bed linen. Free tea and coffee, Guests have access to shared bathroom facilities, 7 share dorm rooms have ensuite . Air-conditioning is available for an additional cost. Free luggage storage is provided while on tours . All tours can be booked free off charge. Two fully equipped kitchens and laundry facilities are available. License bar, free pool table and pizza nights with Free movies on a big screen. 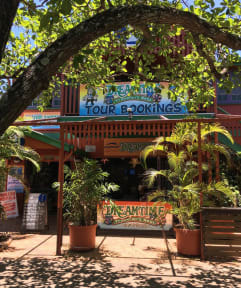 Dreamtime hostel is located directly opposite Railway Station in 3 traditional Queensland homes, a short 15 minutes walk to the esplanade, swimming lagoon and the reef departures. Free transport to the boats . We pride ourselves on our local knowledge, giving you up-to-date information. Free tour booking service on all activities. Traveller-owned since 1990, we understand the traveller's needs. Air Conditioning is available in all rooms and costs $1 for 3 hours. If you have any questions please contact us after booking and we look forward to welcoming you to our Dreamtime soon! Fantastic stay in the Dreamtime hostel. Really relaxed atmosphere. Great music. Nice and simple breakfast with tea and coffee. We arrived late so the receptionist left our key in the safe. We stayed 2 nights and stored our bags whilst we were on a trip to the Reef. Would definitely recommend to anyone to stay here. Me and my travel partner stayed here for one night. We talked to one of the managers Mark a fair bit. He was incredibly friendly, funny, helpful and all around a great guy. He did his job beyond good. The atmosphere here was quiet and chill, if looking for a party hostel, this isn’t the place. The air conditioning in our room didn’t work. Other than that it was such a great hostel. Definetly recommend. Definetly would go back. Such a cute spot, everything was clean the only thing is it is a little bit of a walk from everything. Nice hostel, Gabs was remarkable at the front desk, she was instrumental in helping me book a couple treks onto the GBR. Nice facility although the fans didn't work well in my dorm room. Nice pool. Handy location, across from the train station and close to the huge mall (you walk thru the mall to get to the main part of town). Staff were super helpful with organizing day trips. Location was near the waterfront and transport links. There were cockroaches in the room and kitchen (although this is probably to be expected when the hostel is right next door to the rain forest. Overall we would chose to stay here again.